Charles 2012 Downs World Champion! 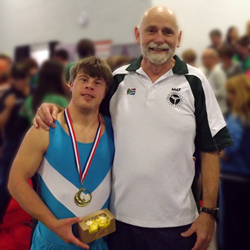 CONGRATULATIONS to Charles Phillips who traveled to Leicester, England from 14-16 September for the 2012 Downs Syndrome World Championships. Gymnasts from all over the world took part in the Championships, including Italy, Russia, Portugal, South Africa, Norway Canada, USA, Mexico, Brazil and Great Britain. Charles competed 5 apparatus in the Artistic Level 4 Senior Section, which uses routines from the Special Olympics program. Level 4 is the highest level competed at these championships. KwaZulu Natal Gymnastics is proud of Charles’ success at these World Championships and all of his hard work and perseverance in training towards this achievement.